Could this large glass of water really be the “diet game changer” some mainstream media make it look like? Or, are we – once again – dealing with the abuse of science to attract readers by propagating dubious dieting myths? The advice to “drink a glass of water before every meal” is about as old as human efforts to lose weight. Yet despite the fact that an increase in daily water consumption is widely advocated as a useful tool to aid weight loss and even included in popular weight loss programs like Weight Watchers, there is, according to the latest systematic review of the association between water consumption and body weight, little evidence to support this practice outside of energetically restricted interventions (Muckelbauer. 2013). In other words: While we do have evidence that replacing caloric beverages with water/diet beverages works (Tate. 2012), we have little evidence that simply drinking more will accelerate weight loss and almost no evidence of the potential benefits water preloading before meals, in particular. “[b]oth studies compared participants given a water preload of 500 ml for 30 min before an ad libitum meal with those not given a preload and found that energy intake at the meal was lower for the preload group compared with the no-preload group” (Parretti. 2015). Thus, evidence to suggest that water preloading may improve the effectiveness of weight loss programs is there. Experimental evidence to confirm that is yet ultra-scarce. In fact, the only RCT (Dennis. 2015) to directly examine the effects of water preloading before meals on weight loss was published five years ago. In said study, 48 adults with overweight or obesity were allocated to a hypocaloric diet plus 500 ml of water before meals every day (water preload group) or a hypocaloric diet alone intervention (nonwater group) over 12 weeks. Figure 1: Dennis et al. were the first to show that drinking 500 ml of water before meals everyday can boost the weight loss success of overweight and obese individuals participating a 12-week diet intervention (Dennis. 2010). 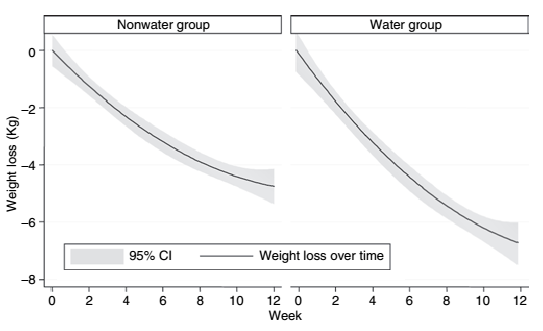 As you can see in Figure 1, the subjects in the water group lost ~2kg more weight than their peers and showed a 44% greater decline in weight over the 12 weeks than the nonwater group. That’s interesting because the energy intake during test meals was suppressed by the additional water load only at baseline, yet not after 12 weeks on the preloading protocol (see Figure 2). 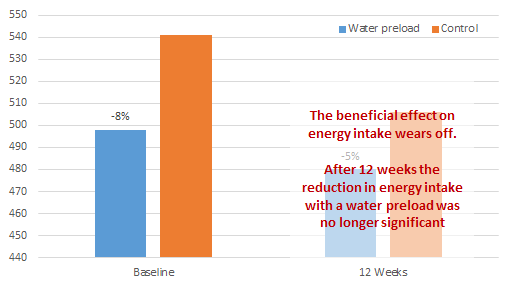 Figure 1: In a previous study the beneficial effect of the water preload on food energy intake wore off. The subjects in Dennis’ study still lost more weight with the preload, but with respect to the long-term efficacy of drinking 500ml of water before every main meal this is an important result we should not forget (Dennis. 2010). In that, the “(*)” denotes something you might consider weird… and what should I say? It is weird to imagine that your stomach is full before a meal, but that’s Parretti’s way of turning a regular RCT into an attention controlled RCT, where the dummy procedure disguised the true intent of the study and provided a nonspecific intervention that in some ways matched preloading. 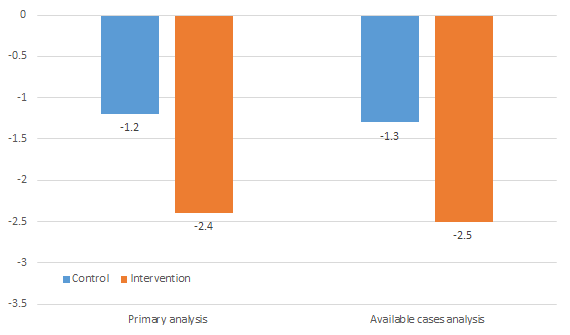 Table 1: Self-reported adherence for both groups – (I) intervention group, (C) control group (Parretti. 2015). It is thus not really surprising that the subjects in the control group (C) hardly managed to follow the scientists advise once a week, while the majority of the subjects in the intervention group (I) consumed their water preload on at least two of three meals per day. The data in Table 1 does yet still leave no doubt that the adherence declined significantly over the 12-week period. Whether the Parretti study is able to answer the previously raised question, if the chronic use of water preloads may reduce their efficacy, is thus highly questionable. I mean, after 12 weeks, almost half of the subjects didn’t use the preload anymore. Against that background, I would not interpret the stable satiety and fullness levels from week 2-9 as evidence that there is no such habituation effect. And in view of the lack of data on the actual food intake, the satiety and fullness data is pretty much irrelevant, anyways (just as there’s a disconnect between mTOR and actual muscle gains, there are also disconnects between appetite, fullness and food / energy intake – if you don’t measure the relevant outcome you’re groping in the dark). What is relevant and hard to reject, though ,is the fact that the water preloading group lost 1.3 kg more than the subjects in the control group (see Figure 2) – with a statistically significant difference of 1.2 kg still remaining when the data was adjusted for ethnicity, deprivation, age, and gender, the lack of which had been an issue in the previously referenced study by Dennis et al. (2010). The reason I am still not thrilled is simple: Parretti’s study was celebrated in the laypress as the breakthrough research that demonstrates that you can easily lose weight by simply drinking 500ml of water before each and every of your meals. Unfortunately, this is not just a broad overgeneralization of the results it is simply a completely false interpretation of the study. What Parretti’s study does suggest (not prove) is that drinking 500ml will accelerate the weight loss on energy reduced diet. Daniels, Melissa C., and Barry M. Popkin. “Impact of water intake on energy intake and weight status: a systematic review.” Nutrition reviews 68.9 (2010): 505-521. Dennis, Elizabeth A., et al. “Water Consumption Increases Weight Loss During a Hypocaloric Diet Intervention in Middle‐aged and Older Adults.” Obesity 18.2 (2010): 300-307. Muckelbauer, Rebecca, et al. “Association between water consumption and body weight outcomes in children and adolescents: A systematic review.” Obesity 22.12 (2014): 2462-2475. Parretti, Helen M., et al. “Efficacy of water preloading before main meals as a strategy for weight loss in primary care patients with obesity: RCT.” Obesity (2015). Tate, Deborah F., et al. “Replacing caloric beverages with water or diet beverages for weight loss in adults: main results of the Choose Healthy Options Consciously Everyday (CHOICE) randomized clinical trial.” The American journal of clinical nutrition 95.3 (2012): 555-563.